For today’s freebie on DesignModo we have a refined and professional news and politics free PSD template (created by Vladimir Kudinov). This free website template is definitely one of a kind and high in quality. PSD website templates are always considered as one of the most useful tools for designing a website. Website designers and developers often take the help of this tool in order to design fine looking, useful sites for clients and for the users as well. 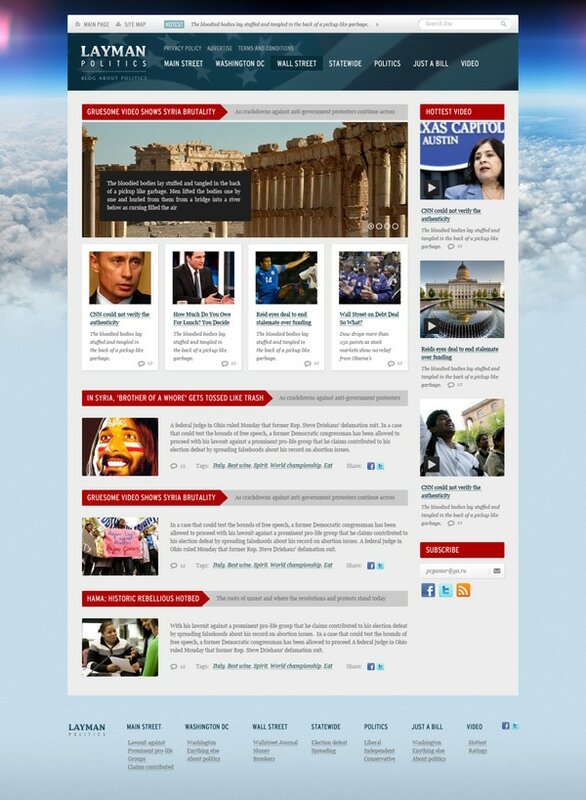 In order to develop sites for news and politics this PSD website template can be used in very creative manner. This PSD template is editable and you can do necessary changes in them, like changing colors or adding image or texts. In the internet there are lots of examples of such PSD website templates that can be used for designing news and politics site. The demand for such websites are so high in the present market that most of the news channels want to have a strong online existence with the help of a stylish and useful website. People love to see and read news online rather than sitting in front of TV. Since it can be accessed at anywhere, anytime so, people like to have online news for being updated with all the latest happenings of the whole world. That is why the demand for smart and modern news websites is all around the market of web designing. Political parties also want to make their approaches globalized and what could be the better way than a website for that purpose. So the demand for websites for politics is equally high in the industry. There are lots of news and politics PSD website templates in the internet. Some of them are even free and you don’t need to pay anything to use those templates in your website. All you need to do is to search on net for the most apt template for your business and download it and use it in your designing project. The method is very simple and hence it can be done by anyone even a person with very little knowledge in web designing can do this. These are cool in design and have plenty of features that will surely impress your visitors. That is why many leading news companies are using these templates for their site and gaining a good traffic for the website. However, before you download free news and politics PSD website templates from the internet be sure about the license of the template and also make sure that the design of the template is perfect for your thought that you wish to deliver to your viewers through the site.